I decided that almost everything had to go so I spent some hours last night removing components from the Northcourt chassis. I had intended to keep the valve sockets but, in trying to unwrap the component leads, it became pretty clear that the sockets were flimsy and it wasn’t going to be worth the effort. The rivets will be drilled out and the sockets will be removed too. That will really only leave the paper-insulated transformers and the chassis itself which is pretty much what I expected. The amp was around fifty years old and the capacitors and resistors were showing their age. The amps I have built up to this point (see the side-bar) have placed all the valves in a row which has allowed me to use tag-strip – between sockets and in front of the tone controls – to mount the components. It results in a messy layout but it does allow the circuit to be changed fairly easily. That was how I was hoping to lay out the Northcourt but I can’t see how it would work. 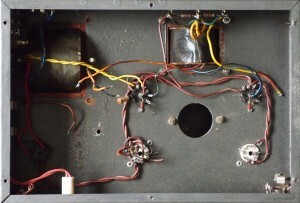 The valves/tubes are laid out in or square rather than a row and are widely spaced which would require long leads between sockets (as per the original layout). Putting tag strip in the middle of the square doesn’t work because of the can capacitor. Placing a tag-strip between the ECC83s (12AX7s) and the tone controls would work well but that’s a relatively small part of the circuit; certainly not enough to justify the approach. Clearly it is necessary to use a tag-board or turret-board. I would prefer to leave the valve/tube sockets visible for rework but there is only 40mm between the ECC83 (12AX7) and EL84 (6BQ5) sockets which does not provide enough space for larger components (e.g. smoothing capacitors). The only sensible approach seems to be to use a wider turret-board and allow it to cover some of the sockets (perhaps only one). Flying leads will have to be soldered onto the socket(s) before the turret-board is put into place. I’m going to use the perforated turret-board and screw-in turrets provided by www.ampmaker.com to allow the circuit to be changed relatively easily. The-screw-in turrets are expensive – especially when compared with tag-strip – but it’s the only sensible approach. Thinking about expense; the amp cost me £85 and the capacitors from AudioCap cost £16. Now that the initial circuit and layout have been sketched out I have been able to buy the remaining bits and pieces which has added another £50 to the cost giving a total of £151 which which seems like a pretty good deal for a hand-wired bass amp. Now the parts have been ordered so the next post should show some real progress. I came across this article about snubber capacitors on the web last night and it got me wondering. I use a snubber capacitor across the primary windings of the output transformer of Little One but I can’t remember if I did any critical evaluation of the amp’s sound before I decided to use a capacitor this way. I certainly don’t use a capacitor and resistor in series as is done in the article. Little One sounds good the way it is so I’m not in any hurry to change the circuit. There isn’t much information on the web about snubber capacitors used across output transformers so I’m going to have to find some time (somehow) to investigate the effect they have unless someone can provide details. After reading Merlin Blencowe’s books (you can find out more about them in an earlier post), I have been inspired to change the circuits of both Little One and Northcourt Mk II. The changes aren’t major but I’m finding Merlin’s books incredibly useful so, if you have any interest in building guitar valve/tube amplifiers buy them before they go out of print (as they surely will). The NOS Svetlana EF86s arrived from the Ukraine and I love them. I only ordered two but when I heard them I was compelled buy another pair. With one of these in Little One it doesn’t seem to matter what valve/tube you use for the phase inverter or the power stage; it always sounds good. I will produce some recordings ASAP. I was looking for a can capacitor for Northcourt Mk II and found the AudioCap website. 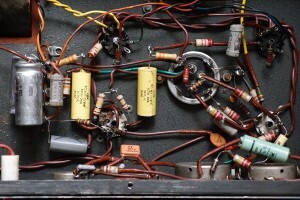 A good source for specialist audio capacitors. The capacitors for the Northcourt rebuild were ordered from there and arrived within a couple of days. Other components will be ordered from AmpMaker but the next step is to plan the layout. More on that later. Raspyfi: Sweet music from a Raspberry Pi? It’s a terrible name; “Raspyfi”. The word sounds like something you would do to a bit of wood. You might say: “I’m sorry darling but the dog’s raspified the kitchen table again”. But, in fact, RaspyFi is an open source Linux distribution that will transform your Raspberry Pi into an audiophile source or so the website says. A bold claim for a £28 computer but I’ve tried it and it works. I connected my SMSL TAD-01 Tripath amp and an external hard drive to my Raspberry Pi using USB connections and was impressed by the quality of the output. The only shortcoming that I can see is that there is no support for DLNA (just Airplay). I’d like to get DLNA working with it because all my music is shared using DLNA so you’ll be hearing more about this soon (I hope). This follows on from my previous post about a small bass amp. In the time since I made that post I’ve been considering my options with the help of the guys over at basschat.co.uk. 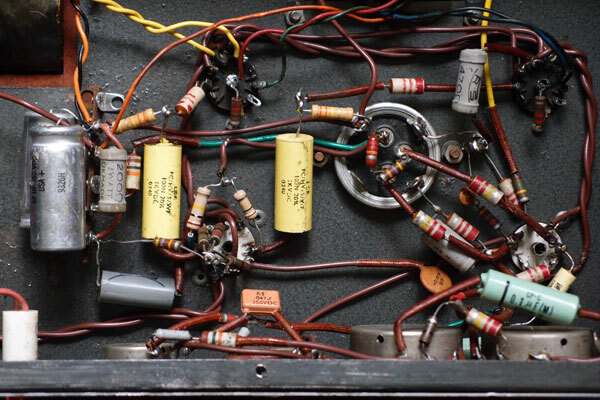 I had it in my head that bass amps would require some sophisticated EQ circuitry to be usable but it turns out that the big issue – for a valve/tube amp – is making sure that your output transformer is large enough. People who like valve amplifiers seem to be happy with simple tone controls. 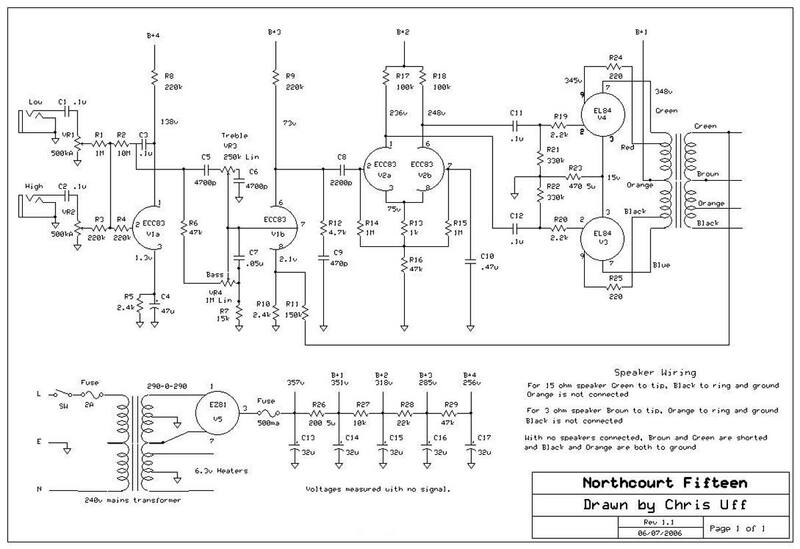 I have taken the time to draw out the schematic of my Northcourt Fifteen and it it turns out that it is different from the schematic I found on the web. The differences are primarily in the power supply and in the tone-stack which are two areas that will need to be redesigned to make sure the amp produces a good, solid bass tone. 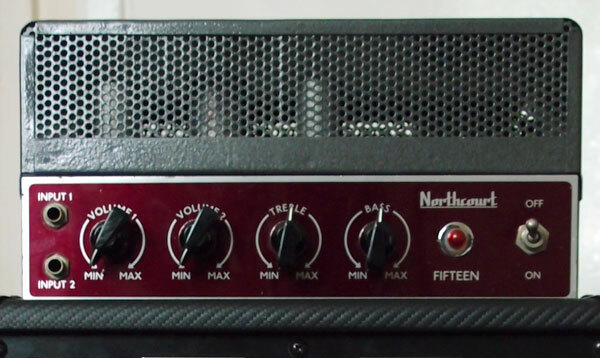 I used the Duncan Amps Tone Stack Calculator to model the tone controls on my Northcourt amp as it is today and I have uploaded the plot as a PDF file. There is good control of the bass but almost no control of the treble output. The values of most of the components in the tone control will have to change. The power supply seems to have unnecessarily large reservoir caps for the two ECC83/12AX7 valves/tubes. The first ECC83 has two 50uF capacitors; one for each side! Normally, when the two halves of a preamp valve are working out of phase they are fed from the same reservoir cap because one valve is pulling more current while the other is pulling less so the action of one tends to compensate for the action of the other. That is why the phase-inverter (the second ECC83) can fed from a single reservoir cap but, even then, it appears to be larger than in needs to be. I have sketched out my first thoughts on a revised schematic and you can see it here but I’m not going to build anything until I have had time to read more of Merlin Blencowe’s books. Feel free to give me any feedback in the meantime.